Duncan Phillips saw American modern artists as equal to their European counterparts and often installed their works side by side. 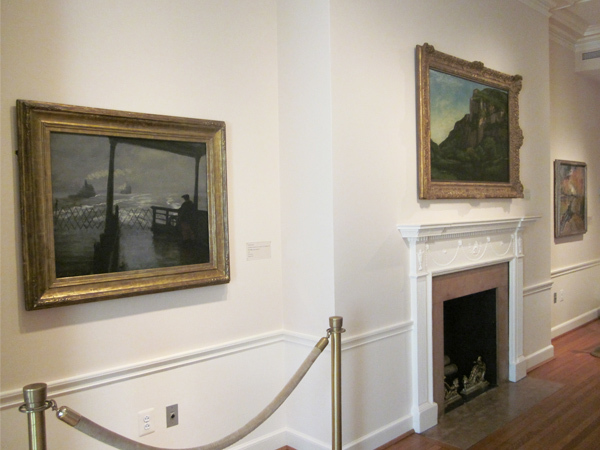 The house parlors are currently hung in this spirit, with American painter John Sloan’s The Wake of the Ferry II (1907) alongside French artist Gustave Courbet’s Rocks at Mouthier (c. 1855). This entry was posted in Congenial Spirits and tagged Duncan Phillips, Gustave Courbet, John Sloan. Bookmark the permalink. The current configuration of paintings in this parlor gallery featuring storms and craggy cliffs has a rugged and masculine feeling. When taken as a whole it adds another impact that is more than the sum of its parts.